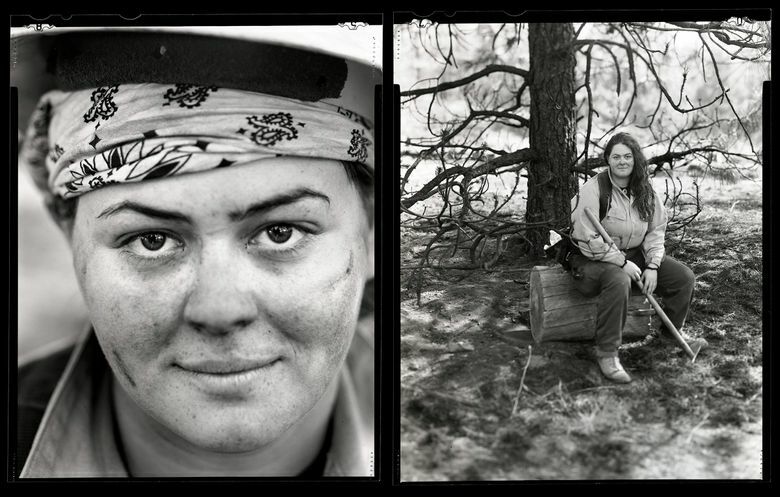 Staff photographer Bettina Hansen talks about how she created her portraits for Pacific Magazine's Women In the Trades story. See the Women in the trades project here. Sounded like a great idea to me, so I got their phone numbers to follow up and it stayed in the back of my mind for the next two months as I thought about different approaches. In 2014, I’d done a 4×5 portrait series at The Moisture Festival, and the aesthetic of the black-and-white film with the large-format camera is what I kept picturing in my mind. It renders skin tones and textures with a lovely tonality and gives a seriousness to the process that slows down subject and photographer alike. It isn’t the cheapest to shoot large-format these days, with the cost per sheet (with processing) about $3.75. However, my editors supported it and I vowed to be judicious with the film. I loaded film holders by night in my bathroom, light-proofed with blankets, towels and gaffers tape. We have a Sinar 4×5 here at the Times that has a 90mm wide lens and a 210mm portrait lens. I used the 210 a lot more, as I shot all of the portraits as verticals to lend a continuity to the series and easily fit into the format of the magazine. It also gave me one less thing to worry about, as shooting large-format can feel like an overwhelming set of steps to make one image and not accidentally ruin it. 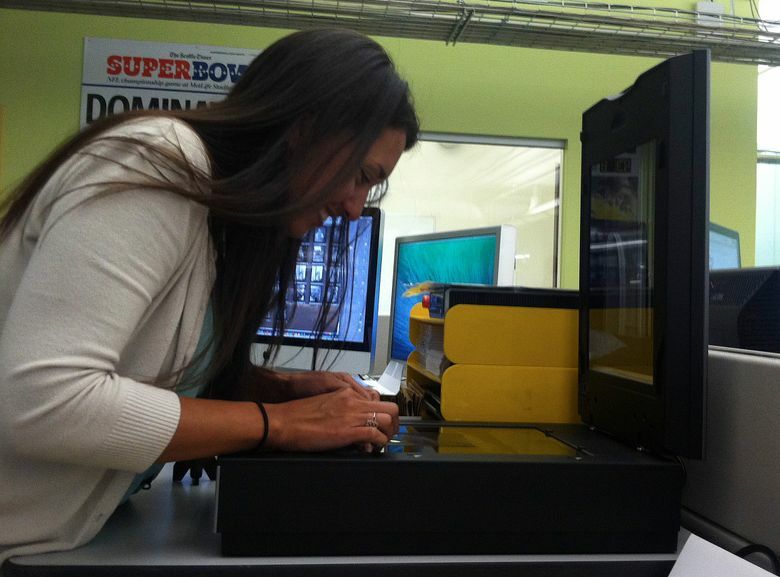 Staff photographer Bettina Hansen scans her 4×5 film in the Seattle Times office. I teamed up with writer Susan Kelleher, and she accompanied me on the shoots to write vignettes about each subject. We borrowed hard hats, safety glasses, boots and visibility vests to get on worksites and aimed for publication on Labor Day. We limited our vignettes to a total of 10 features in order to fit in print and not go over budget. I wish I could have kept shooting, but maybe I can revisit the faces of the hardworking women of the Seattle area again sometime soon.